Promoting Healthy Eating among students at Middlesex University Hendon Campus, London. This intervention is designed to promote healthy eating behaviours among university students for only one day at the Hendon Campus of Middlesex University, London. The reason for this proposed intervention is that university students are vulnerable in their eating habits for various reasons such as stress, food price or deficit in their knowledge of healthy food selections (Ansari et al., 2015). As a result, students are more likely to undergo for foods and drinks with high sugar and salt contents, which contribute significantly to obesity and noncommunicable diseases (NCDs) such as type 2 diabetes and cardiovascular diseases (Deliens et al., 2014). In addition, obesogenic environment can be considered as a contributing factor to promote unhealthy eating, which lead to obesity among university students (Daliens et al., 2014). Therefore, it is very important for the environmental health team to intervene in this case because environmental health officers (EHOs) are committed to improve public’s health by improving food safety, environment, quality and nutritious value of the food (CIEH, 2016). Working and representing the local authorities, this can benefit to enforce laws or policies by highlighting issues related to the student’s health. For example, enforcing laws under food legislation to encourage food businesses to include a variety of healthy food options at an affordable for the students. The EHOs also hold the power to eliminate any conditions, surroundings or opportunities of life, which have on promoting obesity. This is because local authorities have a range of legislative and policies that can help to promote healthy eating (PHE, 2014). For example, quantity of vending machines and its location in the university sitting area. Premises and population group targeted. In this intervention plan, other members from different departments such as Public Health, Health promotion, MDX Student’s Union, counsellor, psychologist, nutritionist and the Food & beverage managers, were all contributed to share their knowledge, expertise and support. This helped to collect ideas and recommendation in order to facilitate the development of effective and tailored intervention programme aiming to reduce levels of obesity via healthy eating behaviours among university students. The university technicians were also used in this intervention to set adverts on the screen around the campus. To develop, implement and evaluate the effectiveness of a multicomponent university-based intervention that focused on promoting healthy eating at the Hendon Campus of Middlesex University, London in order to reduce the levels of obesity among students. Ansari, E.W., Suominen, S., Samara, A. (2015) Eating habits and dietary intake: is adherence to dietary guidelines associated with importance of healthy eating among undergraduate university students in Finland?. Cent Eur J Public Health 23 (4): 306 – 313. Baggott, R. (2011) Public Health: Policy & Politics. 2nd ed. Basingstoke: Palgrave Macmillan. CIEH (Chartered Institute of Environmental Health). (2016) Food safety and nutrition. Available at: http://www.cieh.org/policy/food_safety_nutrition.html [Accessed on 18/01/2017]. Deliens, T., Clarys, P., Bourdeaudhuij, D.I., Deforche, B. (2014) Determinants of eating behaviour in university students: a qualitative study using focus group discussions. BMC Public Health 14 (53): 1471 – 2458. National Health and Medical Research Council. (2013) Eat For Health: Australian dietary guidelines. Available at: https://www.eatforhealth.gov.au/sites/default/files/files/the_guidelines/n55_australian_dietary_guidelines.pdf [Accessed on 20/01/2017]. O’Brien, M.L., Palfai, T.P. (2016) Efficacy of a brief web-based intervention with and without SMS to enhance healthy eating behaviors among university students. Eating Behaviors 23 (2016): 104 – 109. PHE (Public Health England). (2014) Obesity and the environment: Regulating the growth of fast food outlets. Available at: https://www.gov.uk/government/uploads/system/uploads/attachment_data/file/296248/Obesity_and_environment_March2014.pdf [Accessed on 18/01/2017]. PHE (Public Health England). 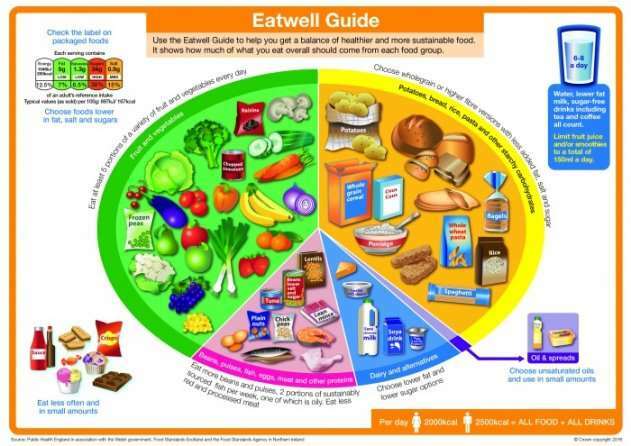 (2016a) From plate to guide: what, why and how for the eatwell model. Available at: https://www.gov.uk/government/uploads/system/uploads/attachment_data/file/579388/eatwell_model_guide_report.pdf [Accessed on 18/01/2017]. PHE (Public Health England). (2016b) Strategic plan for the next four years: Better outcomes by 2020. Available at: https://www.gov.uk/government/uploads/system/uploads/attachment_data/file/516985/PHE_Strategic_plan_2016.pdf [Accessed on 20/01/2017]. Thompson, S.R. (2014) The essential guide to Public Health and Health Promotion. New York: Routledge. Upton, D., Thirlaway, K. (2014) Promoting Healthy Behaviour: a practice guide. 2nd ed. Oxon: Routledge. Alexander, E.R. (2010) Introduction: Does planning theory affect practice and if so, how?. Planning Theory 9 (2): 99 – 107. CIEH (Chartered Institute of Environmental Health) Eat Clever: Food and lifestyles skills toolkit. Available at: http://www.cieh.org/uploadedFiles/Core/Policy/Publications_and_information_services/Policy_publications/Publications/Eat_Clever_Toolkit_English.pdf [Accessed on 18/01/2017]. Helmert, M. (2008) Understanding Planning Tasks: Domaine Complexity and Heuristic Decomposition. Heidelberg: Springer. Mitchell, C., Cowburn, G., Foster, C. (2010) Assessing the option to use the regulatory environment to promote local physical activity and healthy eating. Available at: http://nhfshare.heartforum.org.uk/RMAssets/UKHFreports/Assessingoptionsregulatoryenv_physicalactivity.pdf [Accessed on 18/01/2017]. Naidoo, J., Willis, J. (2010) Developing Practice for Public Health and Health Promotion. 3rd ed. Bristol: Baillere Tindall. Torogood, M., Coombes, Y. (2010) Evaluating Health Promotion: practice and methods. 3rd ed. New York: Oxford University Press. Location, population targeted and health issues. "Promoting Healthy Eating Among Students." UKEssays.com. 11 2018. All Answers Ltd. 04 2019 <https://www.ukessays.com/essays/health/promoting-healthy-eating-students-8691.php?vref=1>. "Promoting Healthy Eating Among Students." All Answers Ltd. ukessays.com, November 2018. Web. 26 April 2019. <https://www.ukessays.com/essays/health/promoting-healthy-eating-students-8691.php?vref=1>. UKEssays. November 2018. Promoting Healthy Eating Among Students. [online]. Available from: https://www.ukessays.com/essays/health/promoting-healthy-eating-students-8691.php?vref=1 [Accessed 26 April 2019]. UKEssays. Promoting Healthy Eating Among Students [Internet]. November 2018. [Accessed 26 April 2019]; Available from: https://www.ukessays.com/essays/health/promoting-healthy-eating-students-8691.php?vref=1.